My flash fiction story “The Internet of Annoying Things” was published in Asymmetry Fiction today. Check it out and let me know what you think! As well, my flash fiction story “Counting Corpses” is reprinted in the forthcoming anthology Drabbledark: An Anthology of Dark Drabbles . Drabbledark will be released on July 20, 2018, but is available for pre-order right now! “Counting Corpses” was first printed in the charity Shadow Box Anthology in October 2005 and reprinted in Issue 2 (November 2016) of Spirit’s Tincture. I’m late to report this on the blog, but I did a Snoopy happy dance a few weeks back after selling my fantasy short story “The End of All Wishes” to Persistent Visions. The editor, Heather Shaw, was very gracious and kind in her acceptance letter. I’m very excited to share this one—I’ll post an update when the story is published. In last Friday‘s post, I mentioned that many years ago there was a publisher who was seriously considering buying the rights to A Devil’s Gospel. A member of their selection committee wasn’t comfortable with one of the themes of the novel, so I wrote an “afterword” to explain why I structured the novel the way I did. Today I’d like to share with you an edited version of that afterword, with the warning that it contains heavy spoilers for the novel. If you’re planning to read the book and would like to preserve the experience untainted, you may want to bookmark this page and return to it later. 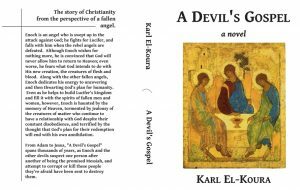 Although A Devil’s Gospel is a work of fiction, it is a work of theological fiction and I’ve endeavored throughout not to deviate from the view of salvation as it is understood in traditional Christianity. In fact, one of my purposes in writing the novel was to demonstrate in a short, hopefully entertaining narrative, specifically that traditional view of salvation history and of God. 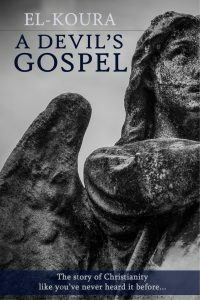 At the core of the work, though, is a piece of theology some Christians might find objectionable: the protagonist is an angel who rebels against God but is then redeemed by Christ’s incarnation, death, and resurrection. It isn’t that most churches teach that devils can’t be saved. The traditional position on this question is rather that we should concern ourselves with our own salvation and that of our fellow human beings, about which we’ve been told everything sufficient, rather than the salvation of devils, about which we don’t know very much definitively, and which really isn’t our business. So why do I mind the business of the devils in this novel? Because I believe it is the corrective measure that is required today. In much of the modern world, Christians and non-Christians alike have a view of God that has been shaped by a very particular understanding of salvation. Under this view, the Lord is a wrathful, angry God of punishment, who will send tornadoes to wipe away entire cities of the unrighteous and earthquakes to topple down the houses of His enemies. Fire and brimstone preaching has lead too many Christians to create an idol in their minds, a fire and brimstone deity who will consign their own mother to Hell if she doesn’t belong to their small community, or if her understanding of God is slightly different than their own. Those with a sense of compassion eventually grow disillusioned with this idol, as well they should; those with intellectual honesty can’t countenance such a god, whose pettiness and temperament equals that of Zeus, as well they shouldn’t. What Christians and non-Christians need now is a reminder of the true God, the One revealed in the Old and New Testaments, the One whose mercy and love is so radical that many “religious” people ignore it or apply it only to themselves and never to those they consider their enemies. Do I believe that Satan and his devils can be redeemed? I don’t know, but I do believe that nothing is beyond God’s power. And, perhaps most importantly, I don’t doubt the answer to the question of whether God desires the devils to repent. This is the Good News that modern Christians need to hear. Even a devil can be restored through the power of Christ’s love. Far from a damning God foaming at the mouth to condemn as many as He can, the Biblical understanding is rather of a loving Father who will do anything in His power (which is limited by the gift of free will He granted to His creatures) to save as many as He can. “Love your enemies,” Jesus said, “and pray for those who persecute you.” Who is a greater enemy to humanity than Satan? Who is a greater persecutor? It is true that we have more pressing concerns than the salvation of the devils. But reflecting on such a possibility is worth doing if it serves as a reminder of the true nature of the loving Creator. And, if we’re blessed, such reflection may even nudge us toward having more love for all of His creation, including the devils who are our chief enemies, which will re-shape our hearts to that of the great saints of the Christianity and, and ultimately, to that of Christ Himself. On March 17, I shared the cover I did for the draft of A Devil’s Gospel. 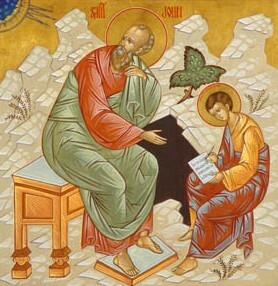 The cover image is of Rublev’s trinity icon, which I felt perfectly encapsulated one of the themes of my novel. The “surface” depiction is of the story told in Genesis 18: Abraham is sitting in the door of his tent when the Lord appears to him. Abraham looks up and sees three men; he runs to them and bows in front of them. Then Abraham addresses one of them as “My Lord” and invites them to stay and rest. It turns out that one of the men is indeed the Lord (and He tells Sarah, who is very old and barren, that they’ll have a son) and the other two are angels. For Christians, it’s clear that the man who is called Lord (Yahweh) in this passage is the pre-incarnate Christ. And very quickly, Christians saw this story of Abraham and Sarah extending hospitality to the three heavenly beings as a foreshadowing of the revelation that God is triune. Rublev’s icon is a masterpiece for many reasons (how brilliant of him that the faces of each figure is exactly the same, for example), but exploring or contemplating the beautiful icon is beyond the scope of this post. For my purposes, I loved how well it encapsulated the idea of Christ’s shadow (which I posted about on March 10): this strange story of three men, one of whom is the Lord, suddenly gaining deeper levels of significance in the light of Christ’s incarnation and His revelation of the triune nature of the Godhead. So why didn’t I use it for the final cover? There were two reasons. One (and based on advice from my wife), I wanted something more accessible to a wider audience; I think Rublev’s icon, beautiful as it is, might be intimating or off-putting to the reader who wants to pick up a fast-paced thriller that happens to retell the story of Christianity. Two, something that Father Thomas Hopko said in a recorded lecture has stuck with me ever since I heard it. Father Tom, who used to be Dean of St. Vladimir’s Orthodox Theological Seminary, said that he’d tried very hard to get St. Vladimir’s Press to stop using icons on the covers of their books. 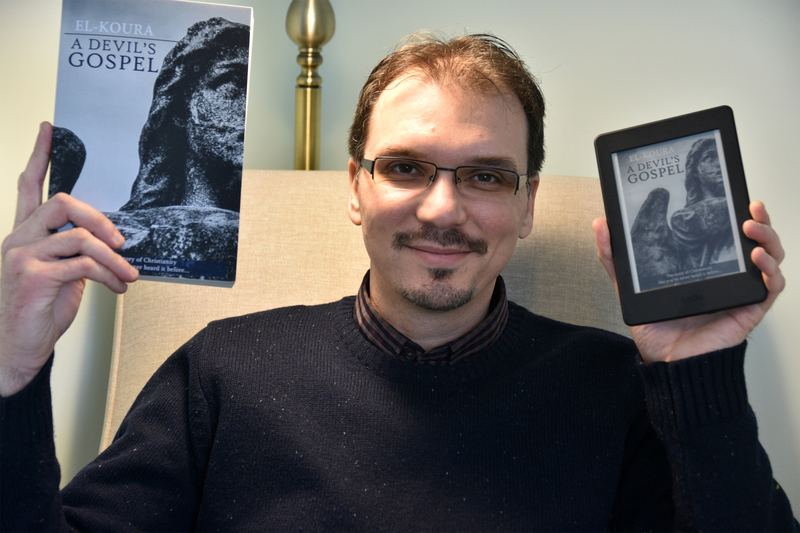 He wasn’t successful, and I believe I understand the reasons why (for the right book, using an icon as the cover image is irresistible—and of course, Orthodox churches use icons as the covers of their bulletins). But his argument sticks with me—icons are holy objects of veneration; they shouldn’t be printed on paper that might end up in the trash, or trampled on, or in a stack under a bunch of other books. I haven’t always followed his advice (the covers for the Father John books, for example, use details of an icon called the Ladder of Divine Ascent), but the force of his argument is enough to make me pause and be sure there isn’t a better alternative. In this case, I felt there was. On March 17, I shared the “throwback” cover of A Devil’s Gospel and promised to talk about the path to publication for this novel. First, I’ll say that the book took me a very long time to write, in part because I was working through the relevant portions of the Bible and several commentaries as I was writing each chapter. In the summer of 2010, I finally felt the manuscript was ready to shop around. I did seriously consider independently publishing the novel (which is in part why I designed the throwback cover and bound together a proof copy to give to my girlfriend at the time, now my wife), but I thought only in terms of print books and hadn’t heard of print-on-demand publishing. The costs were prohibitive. I wasn’t interested in ebooks or aware of how big they were becoming. The way (I thought) traditional publishing worked, one had try to land an agent first. So over the next year I submitted queries and sample chapters. I’m no stranger to following submission guidelines—I’ve been submitting my short stories to magazines since 1998—and I know that different editors have quirks and ways they want to see manuscripts presented. But submitting to agents was a whole other kettle of slush. Many wanted a one-page synopsis; others wanted it in three pages, and some in five. Some wanted a marketing plan. Others wanted you to fill out a questionnaire with very specific questions. Some wanted cash for an “expedited review.” (I find it relatively easy to avoid scam magazines, but in novel-length publishing, it was a lot harder to tell legitimate agents and publishers from scammers). I decided to forget about agents for a while and try a prominent Christian publisher that I felt was perfect for my novel. I sent them a query, and within a week they requested the full manuscript. Once the selection committee had had a chance to review the full manuscript, the acquisitions editor (who was a delight to deal with and kept me informed throughout the process) told me I had reason for cautious optimism, though there was one dissenter on the committee who wasn’t sure about the subject matter. (I quickly wrote an afterword explaining the rationale for the perspective the book takes and sent it to the editor). The decision on the book was deferred from one acquisitions meeting to the next until, finally, it was decided that the publisher would get out of fiction and focus on nonfiction. The whole process had taken almost 40 months, but with the exception of the result, it was positive throughout and made me feel good about my book’s chances. I spent the next four years submitting to several different Christian publishers. On two occasions I never heard back on the query and, after a year of waiting, gave up and moved on to the next publisher. But the world had moved on too. Self-publishing was becoming a real, viable thing. Print-on-demand technology meant one could have one’s books printed, bound, and shipped off to customers with zero direct cost on each transaction. What’s more, ebooks had exploded and it seemed like everyone was reading on their phones, tablets, and the new breed of super-slick dedicated e-readers like the Kindle. That completely leveled the playing field—on an ebook store, a professionally produced self-published (or indie-published) ebook looks no different than a traditionally produced one. I dipped my toes into self-publishing waters with Ooter’s Place and Other Stories of Fear, Faith, and Love and The Lost Stories: A Series of Cosmic Adventures (both collections of previously published short fiction). My wife (then still my girlfriend), coming from an academic perspective, had deep reservations about me self-publishing my previously unpublished novel-length work. So I made a deal with myself: I’d keep A Devil’s Gospel out on submissions but would indie publish the new novel I was working on, Father John VS the Zombies. I finished writing that book in the summer of 2012 and saw it in print before the end of the year. That same summer, I’d submitted A Devil’s Gospel to what I thought was a traditional publisher, which turned out not to be (I posted about that). The experience with Father John was dangerous for my traditional-publishing aspirations. The path to publication for Father John took months and was fun. The path to publication for A Devil’s Gospel…well, two years later (at the time), it still hadn’t been published and I’d spent precious writing time working on variations of query letters and synopses that I suspected the intended recipients had never actually read in some cases. And I’d unwittingly walked into a vanity publishing trap. Still, a deal was a deal and I was committed to keep trying the traditional publishing route with A Devil’s Gospel. On to the next query. 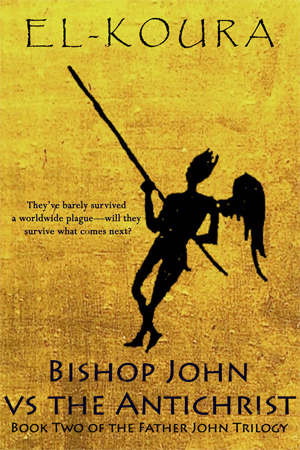 In the summer of 2013, my wife and I took a trip to Greece and I was inspired to start working on the sequel of Father John, which became Bishop John VS the Antichrist. I finished writing that book in the summer of 2014 (don’t ask me why it seems summer is my productive novel-writing season) and saw it in print by spring of the following year. A Devil’s Gospel was still out with a publisher so I waited…and waited…and waited. By the end of 2016, though, I knew that I didn’t want to pursue a traditional publishing deal. There were too many well-publicized horror stories of publishers behaving badly: their contracts grabbing rights with both hands, rights that they had no intention of exploiting; insisting on non-compete clauses; giving the writer a pittance for ebook royalties; and maintaining poor record-keeping practices, which meant that many writers couldn’t believe their royalty statements (even if they thought their publisher was acting in good faith, which wasn’t always the case). Although my indie published fiction hasn’t been overly successful in financial terms (I make more selling a short story to a professional magazine than I currently get from a year’s worth of sales of my indie-published books), it’s been successful in a way that’s much more important to me. In 2017, when I realized that this Easter would be the last one East and West would celebrate together for another 17 years, I decided that was the kick in the pants I needed to start the process of publishing A Devil’s Gospel myself. It pleased me to say that it would be released on Palm Sunday, and not have to specify which one. I’m excited to have the story out in the world. And to put it out into the world, I don’t have to jump through any query or synopsis hoops, don’t have to wait for anyone’s permission, don’t have to contort my story to meet someone else’s guidelines or biases. This the story I want to tell, in the way I want to tell it. The ebook pre-order price is 50% off regular price, so get it while it’s cheap! After you place your order, it’ll be auto-delivered to your device on Palm Sunday (April 9). And if you’re in the US or the UK, you can also order the paperback version from Amazon (more stores, and more countries, coming soon). If you order it now, you should have it in your hands by Palm Sunday too! If you need some convincing, you can read the first chapter for free. So choose your flavor, paperback or ebook!